Judy Leila Schafers is a rural Alberta girl, through and through. Born in Edmonton, Alberta, Canada, Judy grew up in the countryside on her parent’s farm near Barrhead, Alberta. Judy and her husband Shane reside near Villeneuve in the idyllic Alberta countryside where they operate a farm with Shane’s parents. Shane and Judy are the proud parents of two grown children, son Devin and daughter Jilene. Judy’s key artistic influence has always been Mother Nature. Judy credits her parents for allowing her the freedom to immerse herself for countless hours exploring the Hemmerling farm, where she explored every rock, flower, country road and pond she could find. It was this solitary process of analyzing the rural landscape that provided the catalysts for Judy’s future artistic philosophy. Judy has always been inspired by the energy of plant life, of beautiful gardens, and the vast, ever changing Alberta skies. Judy’s renderings of glittering snow, stoic rocks and the brilliant botanicals that depict a wondrous, natural vitality, denote a realistic style that Judy has perfected over time. Her botanical and floral paintings have been said to glow from within with translucent energy. The artist’s traditional landscapes have been appreciated by patrons in view of their ephemeral, changing light. A trademark of Judy’s landscapes is her enigmatic, cool palette of purples, greens and blues. People often comment on how peaceful the rural landscapes appear to be, and how the landscapes transport them to special times and places. It was during high school, when Judy won honor awards for her art and completed her second acrylic painting, that Judy’s career was born. She recalls how the art teacher literally tossed painting supplies in her direction and told her to “just go for it!” Judy’s talents were honed without formal education, yet her work is defined by clients as being mysterious, ethereal and magical. Judy’s first public exhibition was in St. Albert, Alberta, in 1993. 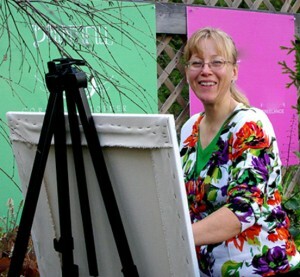 She has continually exhibited her art in the Greater Edmonton, Alberta area, as well as in the communities of Westlock, Morinville, Red Deer and St. Albert. Judy has been actively involved in numerous group artist exhibitions, beginning with the St. Albert Painters’ Guild in 1995. More recently, Judy has successfully entered solo and small group exhibitions at the Art Gallery of St. Albert, The Studio Gallery in St. Albert, and the Spruce Grove Art Gallery in Spruce Grove. She has served in several capacities on the boards of the Allied Arts Council of Spruce Grove, and the St.Albert Painters’ Guild. Judy is currently represented by Monk’s Art Gallery and Studio in Parksville, Vancouver Island, B.C., as well as the Daffodil Gallery on 124th Street, in Edmonton, Alberta. Every November, Judy takes great pride in hosting her popular Open Studio Weekend in her light filled, Prairie Sky Studio, in the country. Over the years Judy has been honored to win numerous art awards including placing as a finalist several times in the Canadian Brushstroke Magazine’s Painting Competitions. Judy’s work has been enthusiastically received by private collectors around the world, including in the United States, Australia, New Zealand, Germany, Spain, Japan, China, UAE, and Iran.Her art also resides within corporate collections of the City of Spruce Grove as well as within several accounting firms, law firms and other businesses. 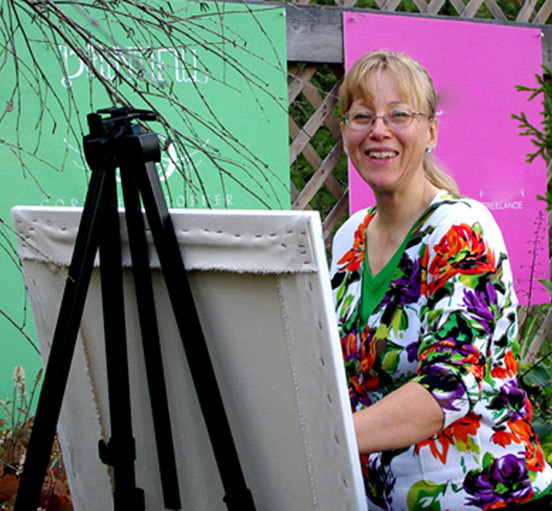 When she is not immersed in creating her treasured paintings and learning the business of art, Judy enjoys gardening, photography and connecting with friends and family.